Yes, Dirk's a Douglas Adams character, his protagonist for his other series of books. In Dirk Gently's Holistic Detective Agency, there's a Michael Wenton-Weakes, dubbed "Wednesday Week" by his old school friends. He hates it. If you like Douglas, you might want to check it out. Oh, and Steed's new suit is very shiny! So that's the third reference for WednesdayWeek that I've picked up since adopting the name. Interesting. Yes. Steed's suit. Well....I'm sort of looking back at him with Pop eyes and through the prism of A Clockwork Orange. At least....I think that's what I'm doing. So far as the drawing goes, I'm trying to get as close to the originals as possible, but when it comes to the colouring...I'm happy to experiment. 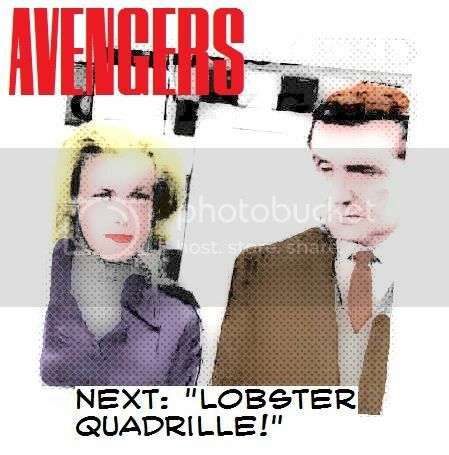 The other thing is....I can't help wondering what Steed would look like today. I mean...what would an Etonian secret agent who also happens to be a bit of a dandy be wearing.....now? I'm currently doing a drawing based upon the chessboard sequence. My Emma Peel is looking good. I'm beginning to get the hang of Diana's physique. But my John Steed currently looks rubbish. I shall have to do some more work on him. You know the leather jump suit that John Bates designed for Diana? It's a really good piece. I mean the design is first rate. Very clever. Not overstated. And one of the things I really like about it is that it's got a slightly "broken in" look to it - as though she's been wearing it for some time. I thought these colourful interpretations of our heroes by Jez Tuya were fun. ... and I didn't lift a pencil or brush. Ooh, I like it! Very comic-booky. I hope, that Cathy and Emma didn't get tipsy. Feat your eyes on this, Emma Peel fans! Would look very good as a future cover on the new comic-book. It looks indeed very good as a cover. Her hair's gotten bigger, but it's streets ahead of anything I could do. It always makes me happy to see people still remembering the show enough to draw it. Nice find, Dandy. I've just been looking at the deviantart website mentioned earlier in this thread. It has quite a lot of great Avengers fan art. There's also a photo-comic story covering part of the episode Split!. (Unfortunately, you have to register to view it - well I had to anyway - as the mature filter is on). I like it so much!! 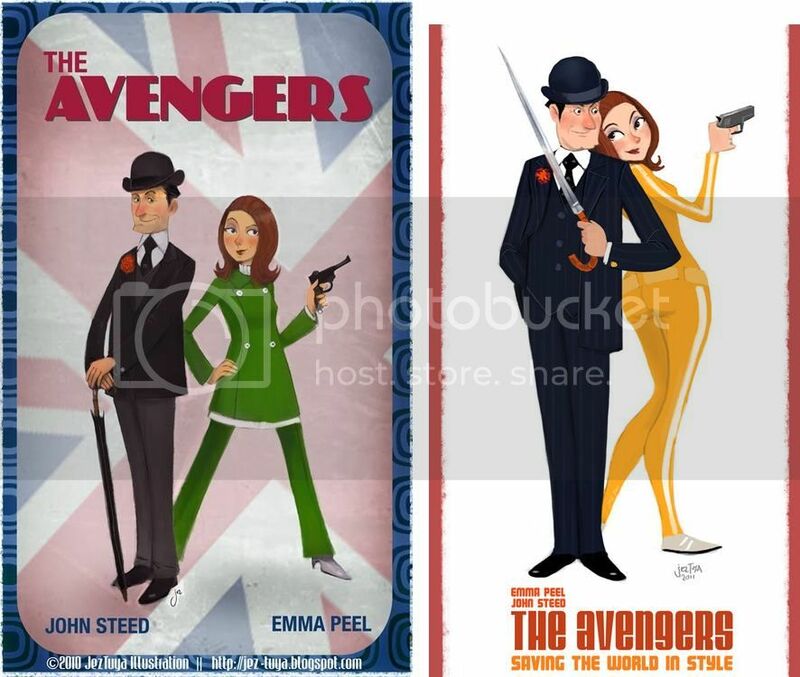 The Avengers - everything Steed and Mrs Peel. I think, they deserve some freetime. 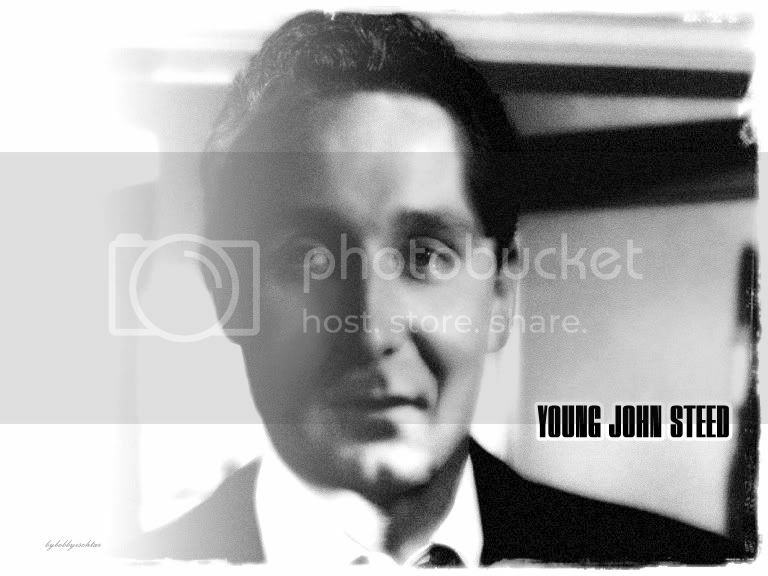 What would John Steed have looked like as a younger man? HAHAH! Love it!! More please!